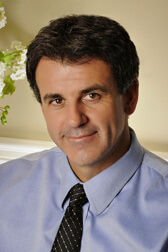 Dr. Glynn Bolitho is a quadruple board-certified plastic surgeon serving the greater San Diego, California, area. With certification in the United States, Canada, Britain, and South Africa, Dr. Bolitho is a well-rounded surgeon dedicated to improving the confidence of his patients. He specializes in breast augmentation surgery, bringing carefully refined surgical skin and the latest implant techniques to patients near La Jolla. Choose from silicone implants, saline implants, breast reduction, breast reconstruction, and other related breast surgeries at Dr. Bolitho’s San Diego clinic. After earning his medical degree from the University of Witwatersrand in Johannesburg, South Africa, Dr. Bolitho continued his preparation to become a plastic surgeon. He participated in a number of prestigious training programs for 12 years, including a fellowship in plastic surgery at Emory University in Atlanta. Nowadays, Dr. Bolitho frequently attends aesthetic and medical seminars to keep his expertise top-notch. Contact our representatives today to schedule an in-depth consultation with Dr. Bolitho in La Jollo, near San Diego, Chula Vista, Del Mar, La Mesa, Escondido, and beyond. Contact us to arrange a private consultation with Dr. Glynn Bolitho today. "I felt very comfortable with Dr. Glynn Bolitho and his staff. He is serious, caring and a very qualified surgeon.. and i'm glad I came through this website and with Amanda's help found the right surgeon for me. I found the service very efficient and the staff that helped me caring and helpful. I had other consultations before but honestly.. haven't felt in better hands. He is a real doctor.. caring and qualified.. two things that should always go together. Cosmetic surgery (or any surgery) should never be taken lightly.. so I strongly recommend him and this website to everyone who is thinking about cosmetic surgery and wants to be in good hands. I will use this website again in the future and recommend it to anyone I know. Thanks again :) ! "